We missed our regular Sunday Wal-Mart trip due to life being in a bit of upheaval right now. Lloyd was ok with a quick stop at a regular grocery store, but was sad to miss out on his weekly Icee. “Can’t I just freeze some Pepsi and make one?” he whined asked. “Knock yourself out,” I replied. I think I have cemented my argument for getting an in-counter beverage gun. Woo-hoo! Interesting… how did the texture compare? It’s really pretty Icee like. 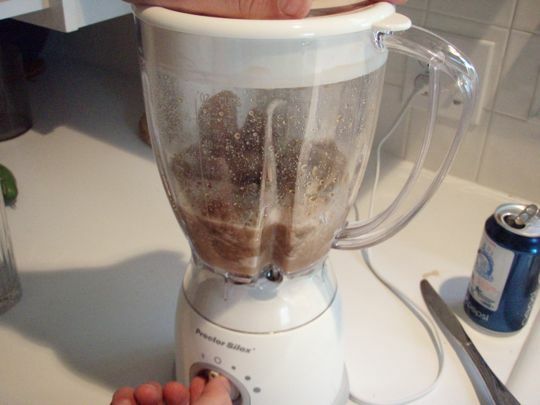 There were a few chunks left from the blending, but they were not hard like ice. It was more like when the normal Icee drink gets crusty at the top. I’m trying this. As soon as I find an ice cube tray. Because, once one has a working ice maker, doesn’t one usually get rid of the trays? That’s what I did. Dang it. so THAT’S the reason that I have an ice cube tray collection even though I have an icemaker! Thanks for justifying that little bit of clutter, Beth. Are you kidding me? I have several ice trays. I know…it is hard to believe. So when you want a regular cup of Pepsi, and want it REALLY cold, but hate the wateriness of melting ice cubes… you could use pepsi cubes! But you would have to plan this out a day in advance… It does look good Lloyd! I was just thinking….could you put a can of pop in the freezer, let it freeze (hopefully it won’t burst), and then take the top off with a can opener? 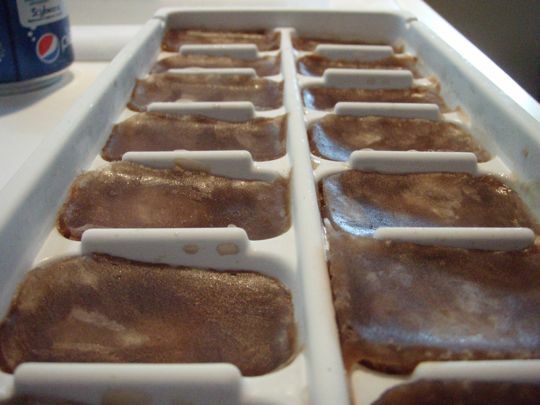 Then you wouldn’t need an ice tray. I think I will try this. 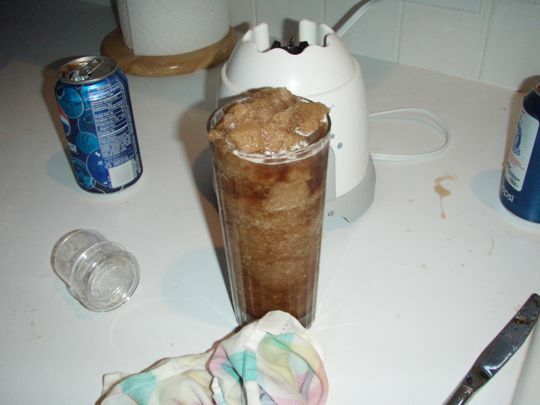 When I was a wee lad we would pour a can of soda into a cup and freeze it. The strange thing was that when it was done freezing it would always be hollow. There would be a large empty cavity in the middle of the frozen soda. For this reason, I don’t know if I would put a can in the freezer. But, on the other hand, what do I care, it’s your freezer. Oh, by all means, I know what happens when you put a can of pop in the freezer. I have had major explosions before. Some how the pop froze in mid air and arched from the rack to the door. It was pretty cool looking. But I have frozen a can completely without bursting. I think it had to do with how fast it froze and at what temperature. I will experiment. Also, don’t leave cans of Diet Coke in the car in the winter. Bigger disaster. Geez, I admire your resolve to wait all day! What patience!! I was wondering if it would work if you didn’t let the pepsi cubes freeze all the way…cause then they’d be already e a little slushy…but more importantly, you wouldn’t have to wait as long to satisfy your craving. please remove 2nd be…I’m apparently becoming an illiterate. HAHAHA!! I laughed out loud. Forgot to mention that Fresca is a fantastic frozen treat in the summer. Highly recommend it!! Don’t let it freeze all the way, though. Check and stir every once in a while until your desired consistency.